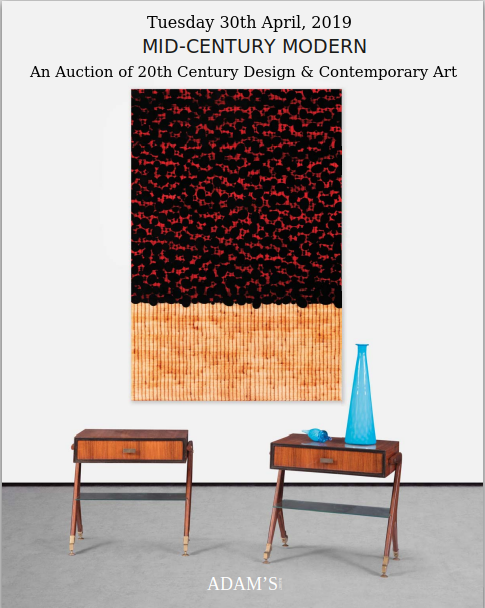 Adams sale of Art from The Irish Bank Resolution Corporation exceeds expectations! 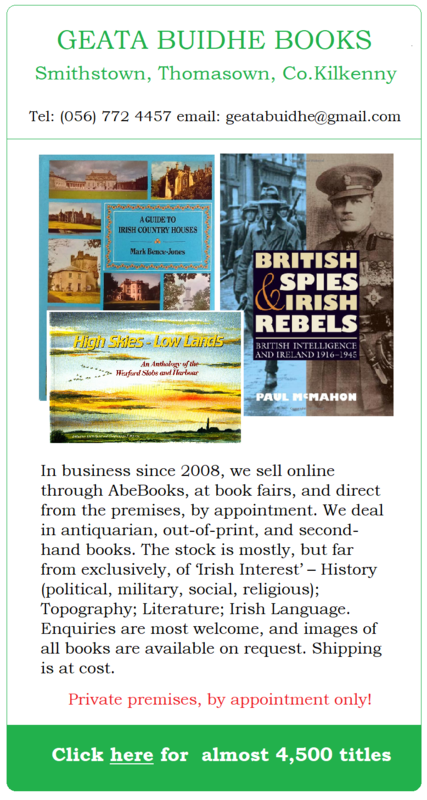 Well, the results are in from Adams’ auction of Art from The Irish Bank Resolution Corporation and while the sale raised more than anticipated – €281,000 against the pre-sale estimate of €150,000-200,000 – it says more about the ability of James Adams’ marketing department than the shrewdness of purchases by Anglo Irish Bank. I wonder how much was spent on their original acquisition? 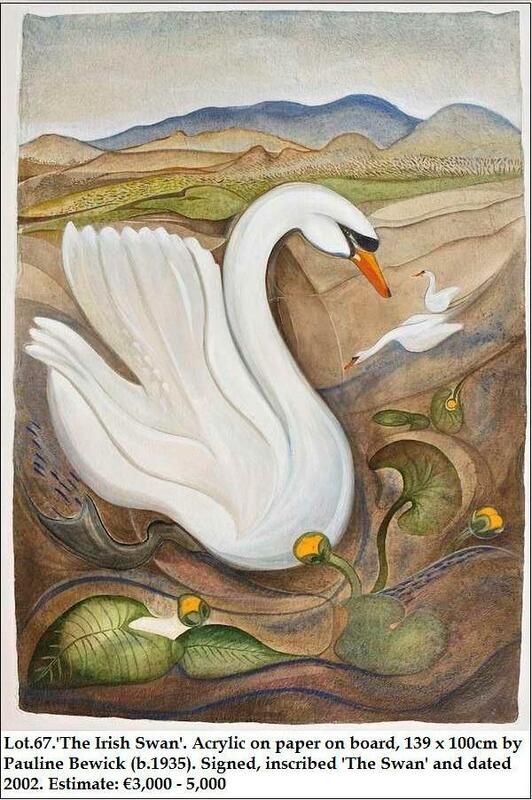 Pauline Bewick’s six wonderful paintings exceeded their pre-sale estimates and contributed some €44k or about 15% of the total proceeds of the sale. 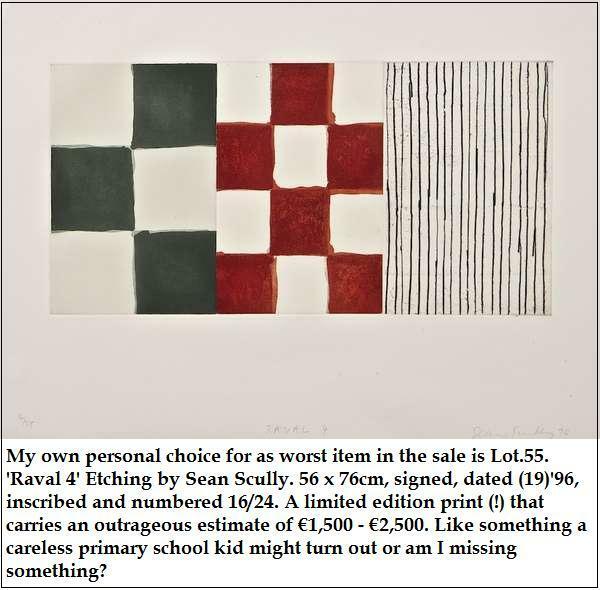 Inexplicably, rubbish by Felim Egan and Sean Scully continues to find buyers but surely it can only be as an investment? Just like property, the chickens will come home to roost one day. I mean would you really hang this on your wall? 134 lots were offered for sale and only 9 remained unsold. The most expensive item was a painting by artist Stephen McKenna which was sold for €17,000. Judging from most of the offerings contained in Adams forthcoming sale http://www.adams.ie/The-Irish-Bank-Resolution-Corporation-Ltd-In-special-Liquidation-Art-Collection/03-09-2013?gridtype=listview from The Irish Bank Resolution Corporation, the bankers were as poor investors in Art as they were in running the banks. Amongst the works on offer there are pages of low grade abstract art prints (!) 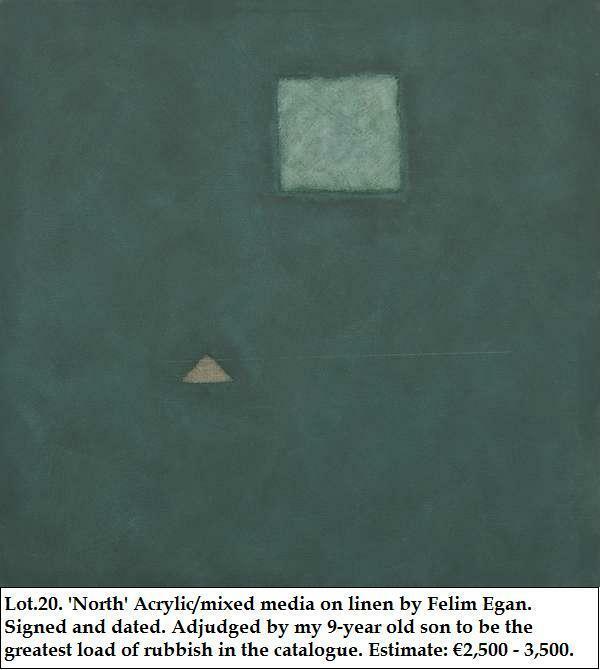 by Sean Scully, and mixed media by Felim Egan – both once very much in vogue with the intelligentsia of Corporate Ireland. In fairness, to Adams, they can only sell what’s before them but there’s mighty little worthy of wall space in the sale and I will await the results with interest. The six wonderful Pauline Bewick paintings stand out like beacons amongst the dross; there’s some value – and art – amongst the cheaper lots by lesser known artists. Paintings that you would enjoy looking at and showing off to your friends. Above one of the finest paintings in the sale and below some overpriced office boardroom/hotel lobby fodder. As expected, Lot.21. 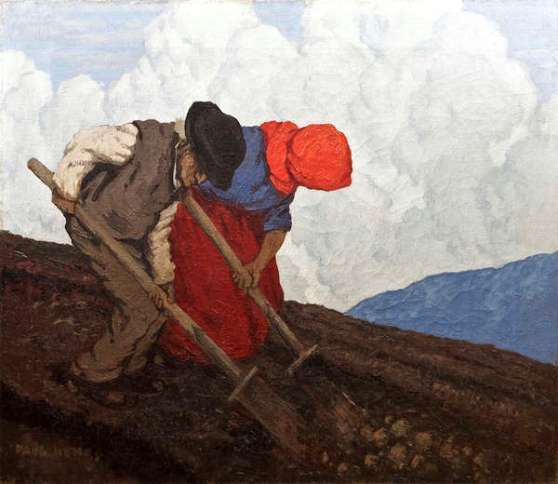 Paul Henry’s “The Potato Diggers” topped the bill at Adam’s sale of Important Irish Art in Dublin yesterday (29th May, 2013) – and exceeded the high end of its pre-sale estimate by €50,000! 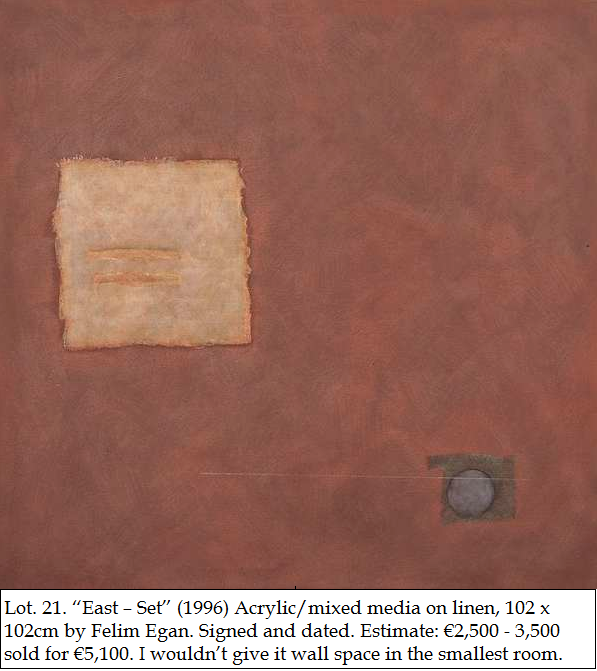 The second highest price paid was for another work by the same artist – Lot.22. “Thatched Cottages with Lakes & Mountains Beyond” which went for €130,000. The third highest price was paid for a fine work by Walter Osborne Lot.44. 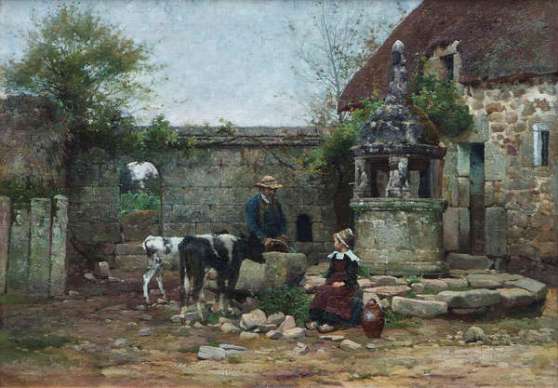 “A Grey Morning in a Breton Farmyard” (pictured below) which sold for €100,000. 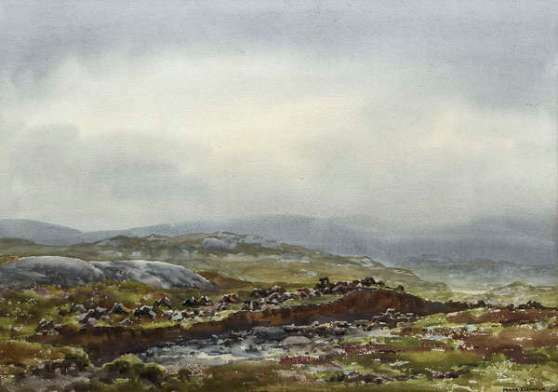 Art Lovers – at least those with deep pockets – are spoilt for choice this coming week with Whyte’s sale of “Important Irish Art” at the RDS on Monday 27th May followed by James Adams sale on Wednesday 29th May also aptly titled “Important Irish Art”. 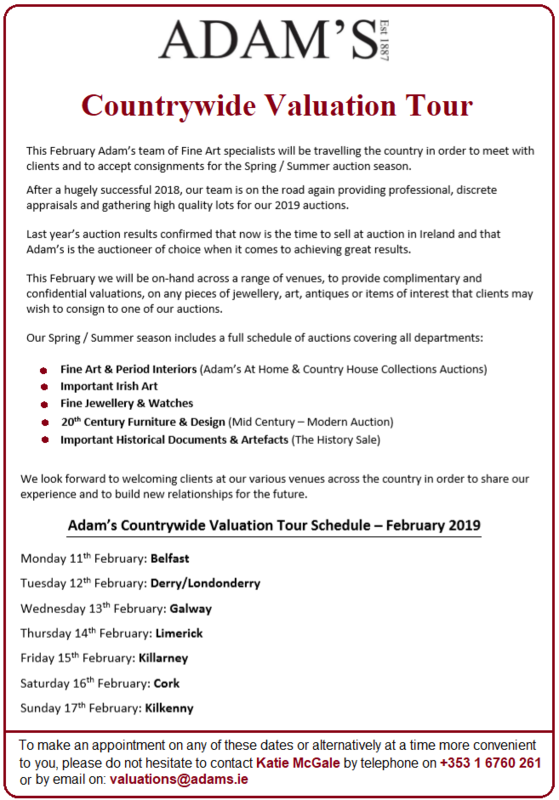 James Adams sale at their St.Stephen’s Green salerooms on Wednesday 29th has more works by Paul Henry but this time with seriously high estimates – no Nama refugees need attend! Lot 21 a superb oil on canvas ‘The Potato Diggers’ has never been seen at auction before and carries a serious €250,000.00 – €350,000.00 estimate. Four other Paul Henry works make it into the top seven lots of the sale price-wise but none are as special. Once away from the top ten lots, prices come down from the stratosphere to more affordable levels and include some nice William Percy French watercolours – just a pity that so many of his works are so small! Better value, and covering the same ground, are several larger works of more recent origin by Frank Egginton – Lot.169., below, carries a modest €500-700 estimate. Obviously the name doesn’t have the same cachet but if you’re buying for art rather than investment they are worth a look. 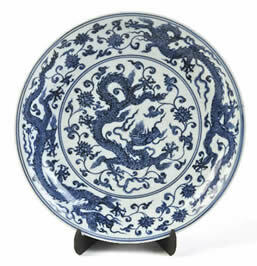 Ming dynasty plate fetches 100 times estimate at James Adams Sale!